Storage tanks along the South Fork of the Santa Clara River at Magic Mountain Parkway hold contaminated water pumped Friday from a pair of CLWA (Santa Clarita Water Division) wells that were shut down in 1997 when perchlorate was detected. Chemical that migrated from manufacturing sites to Santa Clarita's underground water supply is challenging government agencies to understand its prevalence and protect public health. Carelessness, indifference, ignorance. Words used in the latest edition of Western Water, the organ of the Sacramento-based Water Education Foundation, to explain the cause of the perchlorate contamination in much of California's water supply. How much? Environment California, a public-interest research group, reports that 70 billion gallons of water — equivalent to 35 percent of the state's supply from the Colorado River — is tainted with contaminants such as perchlorate and the gasoline additive methyl tertiary butyl ether. The latter, known by its acronym MTBE, was the big headline grabber until Erin Brockovich — both the activist and the feature film — thrust chromium-6 into the spotlight. Before that, man-made solvents like trichloroethylene (TCE), which attacks the human central nervous system, made people nervous when it leached its way into the ground in places like Sand Canyon, where the specialty metals fabricator Space Ordnance Systems (SOS) was found in 1984 to have stored and dumped its hazardous waste illegally. The 1970s brought the first accusations that Keysor-Century Corp., a plastics maker in Saugus since the 1950s, was releasing vinyl chloride, a carcinogen, into the air and water. The target of an ongoing criminal investigation, Keysor-Century shut its resin plant Jan. 1 this year. Earlier still, pesticides were found to harm more than just insects, prompting the federal government to ban a particular type of trichloroethylene — dichlorodiphenyltrichloroethane, or DDT — in 1972. Just two years prior, President Richard M. Nixon announced the formation of the U.S. Environmental Protection Agency, which would coordinate the disjointed approach to ridding the air, water and land of pollutants. Today, high levels of chlorides and nitrates are making sporadic news, but topping the EPA's list, thanks in no small measure to state and federal lawmakers who've introduced a flurry of legislation this year, is perchlorate. Why now? Why, if perchlorates have been known to exist in groundwater in various parts of the state since the 1950s? Carelessness, indifference, ignorance, says the Water Education Foundation. Carelessness on the part of manufacturing companies that mishandled perchlorate waste, and regulatory agencies that didn't adequately regulate. Indifference by politicians who focused instead on whatever chemical was capturing the public's imagination at the moment. Ignorance about the harmful effects of perchlorate in low doses — something scientists didn't begin to study, and health officials couldn't competently measure, until 1997. Perchlorates are the salts of ammonium, potassium, magnesium and sodium. Most of the perchlorate manufactured in the U.S. is ammonium perchlorate. It's often used as an oxidizer to boost the energy of solid rocket fuel, although it's used in other industries as well. It is better suited for a rocket engine than a human body. Perchlorate inhibits iodide uptake into the thyroid gland, which releases hormones to regulate metabolism in adults, growth in children and development of the fetus. "Impairment of thyroid function in expectant mothers may impact the fetus and newborn and result in effects including changes in behavior, delayed development and decreased learning capability," according to the EPA, which said Jan. 22 that its latest studies show "pregnant women and the fetus in utero are the most sensitive populations of concern for perchlorate toxicity." Rusty water taken Friday from a CLWA well that has been shut for 5 1/2 years will be tested for perchlorate and other contaminants. How much perchlorate is "safe?" The jury's out. Neither the federal nor state governments have issued a final ruling on how much perchlorate can remain in drinking water, and they aren't expected to do so until 2007 (although legislation by U.S. Sen. Barbara Boxer, D-Calif., would advance the timeline by three years). But the more that is learned, the lower the provisional "action level" is moved. In 1998 perchlorate made the EPA's list for consideration as a regulated chemical. 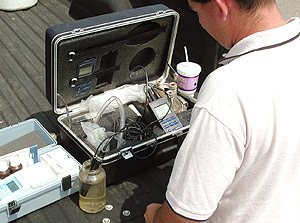 In 1999 the EPA started requiring agencies to monitor perchlorate levels and advised them to take remedial steps if they detect perchlorate in concentrations of 4 to 18 micrograms per liter (commonly called parts per billion, or ppb). It's not that 4 ppb is necessarily safe; it's simply that no methodology exists to detect perchlorate below 4 ppb. In January, the federal EPA advised water purveyors to "consider the low end" of the 4-to-18 ppb scale, prompting the California Department of Health Services to adopt a 4-ppb action level. The state Office of Environmental Health Hazard Assessment has said it will set an official "public health goal" between 2 and 6 ppb. The Water Education Foundation puts it into perspective: 1 ppb is equal to a grain of sand in an Olympic-sized pool. Each of two solid rocket boosters on the space shuttle uses 700,000 pounds of perchlorate. And in years past, the boosters were flushed with high-pressure jets and the perchlorate often drained directly into the ground. If bottled water seems like a panacea, consider that bottlers draw water out of wells throughout the state, and bottled water is regulated by the federal Food and Drug Administration. Public water supplies are regulated by the state Department of Health Services, which holds public water utilities to strict — some say stricter — standards. "Bottled water is a little bit of a crap shoot," said Stephen J. McLean, operations engineer for the Castaic Lake Water Agency. "They don't have the same testing." But while the environmental regulators move closer and closer to a zero-tolerance policy on perchlorate, they're raising eyebrows at the Pentagon. Since most perchlorate contamination is linked to the production of rocket fuel, the bulk of the multi-billion-dollar nationwide cleanup burden could fall on the military and its contractors. DOD officials have been quoted as saying they believe perchlorate concentrations as high as 200 ppb might be safe, and media reports have indicated the final 2003-04 defense authorization bill might be amended to exempt military bases and certain defense contractors from liability for perchlorate contamination. At least 20 states have reported perchlorate contamination, but it is Southern California, the hub of the nation's defense industry after World War II, which may have the biggest problem. At least 267 groundwater wells are polluted across the Southland, including five that have been shut in Santa Clarita — four of them in 1997, a fifth in 2002. The Santa Clarita Valley gets about 40 percent of its water out of the ground, through wells belonging to the four municipal water purveyors — Newhall County Water District, County Water Works District 36, Valencia Water Co. and CLWA's Santa Clarita Water Division. The other 60 percent comes from the State Water Project and is distributed locally by CLWA to the four water companies. State water is blended with groundwater before it reaches the consumer's faucet, although Val Verde residents receive 100-percent state water and Newhall residents have historically received a bit more groundwater than other areas. Closing five of approximately 30 wells had a demonstrable impact on the Santa Clarita Valley's total groundwater supply. Two of the wells in particular "were killer wells," McLean said, referring not to their toxicity but to the fact that they pump more than 3,000 gallons of water per minute, or about 5,000 acre-feet per year. One acre-foot of water is 325,851 gallons, enough to serve two average households for a year. 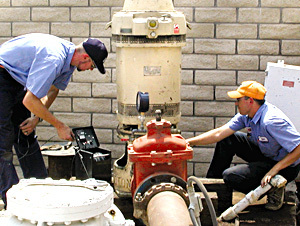 The Santa Clarita Valley uses about 40,000 acre-feet of groundwater annually. Those two big producers were particularly helpful during the drought of the early 1990s, when CLWA was getting virtually nothing from the State Water Project. "They were the biggest supply contributors," McLean said of the closed wells. Production has been ratcheted up on some of the remaining wells to compensate for the loss, but the overall impact today is a reduction in the groundwater supply by about 5,000 acre-feet per year, McLean said. CLWA had to purchase more state water to make up the difference. "The bigger impact (of the closed wells) will be in the longer term when we look to take more water out of the Saugus aquifer," McLean said. Even if all wells were working, CLWA's water plan calls for the installation of more wells to accommodate growth, and in drought years the local purveyors may have to boost groundwater pumping by a factor of three — meaning more wells and more money than would be necessary if the existing closed wells could be used. The five shut wells are located along San Fernando Road, Magic Mountain Parkway and Soledad Canyon Road, below a vacant parcel of land in the center of Santa Clarita that has been in the news ever since the Bermite Powder Co. started hiring employees in the 1930s. Bermite was a prominent local company and an important contributor to the economy for decades. Company homes on Walnut Street in Newhall comprised the first real housing tract in the Santa Clarita Valley, and a job at Bermite was a lucky thing to have during the Great Depression. Bermite made explosives, and its on-site subsidiary, Golden State Fireworks Co., made bottle rockets. In a sense, it played vital roles both in the war effort and in the patriotic celebrations that followed. In 1967 the company was acquired by Whittaker Corp., a missile manufacturer that actively operated the local plant as Whittaker-Bermite for two more decades. Inventories included dynamite, practice bombs, flares, fireworks, oil field explosives, igniters, gas generators, ammunition rounds, Jato rockets, and sidewinder and spin rocket motors. Both branches of the business, bombs and bottle rockets, used perchlorate. Disposal methods weren't regulated — or considered particularly important — in the 1930s. Or the 1940s. Or the 1950s. Or the 1960s. Regulations tightened in the 1970s with the formation of the EPA; in the 1980s Whittaker-Bermite filed cleanup plans; in 1992, officials from the state Department of Toxic Substances Control, a branch of the EPA, raided the facility and determined that the company had purposefully omitted a few things from its reports. Anecdotal information from former employees suggests that in the "old days," waste material was simply tossed over hillsides or buried underground. Physical evidence from the property has revealed "hot spots" where perchlorate has been found in test water wells in concentrations up to 58,000 ppb — nearly 15,000 times above the current action level. Ammonium and potassium perchlorates weren't the only problematic chemicals used in the manufacturing processes. The laundry list of materials included lead azide, red phosphorus, barium, zinc, copper, chromium, tetrachloroethylene (PCE) and TCE. If there's any good news about the valley's contaminated water wells, McLean said, it's that perchlorate is the only chemical that is being detected in excessive levels today. "There is some TCE," he said, "but that's the only other thing that has shown up in any levels of note. But the TCE (level) is not really high. It's less than drinking-water standards." What's really curious, McLean said, is where the perchlorate is showing up. "It's the deep aquifer that's showing the contamination. It doesn't make any sense." Four of the five shut wells tap into the Saugus formation at depths up to 1,700 feet. The Saugus formation, the deep aquifer, is like a huge underground pool below the valley. Above it is the alluvial aquifer, a layer of saturated soil that is the source of about one-quarter to one-third of the groundwater now pumped. The fifth and latest well to be shut is only 100 feet deep and taps into this shallow alluvium near the Saugus Speedway. "We know it's getting into the shallow aquifer, but a lot of it has moved on," he said, theorizing that most of the perchlorate in the swift-moving alluvial aquifer has been flushed westward toward the ocean over the last half-century. But "there is something going on hydrologically," he said, perhaps fissures in the rock, to drive the perchlorate plume deep into the Saugus formation. Project foreman Ron Grace Jr., left, and crane operator Bill Bradshaw of General Pump Co. check the equipment Friday as they pump water at a rate of 800 gallons per minute from a closed-down CLWA (Santa Clarita Water Division) well next to the Saugus Cafe. The 1,600-foot well is being tested at varying levels to determine the depth of the perchlorate contamination. "Something up there is providing a conduit from the Bermite site into the deep aquifer." The hydrology is something the U.S. Army Corps of Engineers is studying now, he said. 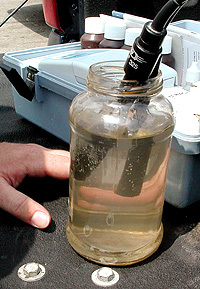 In April 2002 CLWA and the federal government agreed to split the $9 million cost of a phased study by the Corps to evaluate the pathways and the extent of the contamination. This past week, CLWA pumped samples from its two deep-water wells near Magic Mountain Parkway and the Saugus Cafe to determine the precise depth of the perchlorate. "We want to see what the distribution is, depth-wise," McLean said. "We want to see if the water quality has changed since it was shut down 5 1/2 years ago. "I haven't seen the data, but my impression is that (the perchlorate) is not localized, that it's pretty evenly spread." If the perchlorate can be isolated, it's possible — but not likely — that the wells could be reopened to pump at uncontaminated depths, he said. While the studies continue, the matter of who will ultimately pay for the actual cleanup is unsettled. CLWA and most of the local water retailers filed a lawsuit in 2000 to force Whittaker Corp. and other potentially responsible parties to pay the tab. CLWA expects the cost to top $100 million and has announced that it's working on a plan "for a water treatment process to return the (closed) wells to service as soon as possible," and that it has "approved an engineering analysis of all available perchlorate removal technologies to determine which will be the most effective." Meanwhile, on a separate track, a North Carolina company that specializes in brownfield cleanup is expected to decide shortly whether it will purchase the former Whittaker-Bermite property. If it does, it would sign agreements with the city of Santa Clarita and state regulators to clean the soil and underlying groundwater as part of a plan to redevelop the land for industrial, commercial and possibly residential use. "We can pretty accurately draw the extent of the (perchlorate) plume right now," McLean said. "We're getting a decent indication already (of its location)." The contaminated Valencia Water Co. well on the west side of the South Fork of the Santa Clara River near the Saturn of Santa Clarita car dealership was closed in 1997, yet only a few blocks away, "the Valencia well by City Hall is fine," he said. Michael Van Fleet, a staff geologist for the groundwater consulting firm of Richard C. Slade & Assoc. LLC, prepares Friday to ship off a sample of contaminated well water for testing. The contamination isn't migrating because "water doesn't move fast in the Saugus (formation), only a few feet per year." Environmental activist and NCWD board member Lynne Plambeck isn't so sure. "I would like to see how they know ... the Saugus (formation) doesn't move at a greater rate than one or two feet a year," she said. "I would like to see where they've done the studies." The perchlorate has already moved off of the Whittaker-Bermite property and into drinking-water wells up to half-mile away, she said, and the geological characteristics aren't known. Also, the shallower fifth well wasn't closed until November 2002, when perchlorate was found where none had been detected before. In February a judge upheld CLWA's Urban Water Management Plan, which is used by city and county governments to determine how much growth can be accommodated. The county of Ventura and environmental groups had challenged the documents, accusing CLWA of overstating the valley's available water supplies by counting production from the closed wells in the totals. "The latest reports say (the closed wells) are available," Plambeck said. "They continue to fail to tell the supervisors and the City Council that they can't even use those wells." Plambeck believes the water availability figures should take into account the lost capacity of the closed wells and the potential for further closures. "Planners cannot make good decisions if they don't have good information," she said. "They need to stop the (new housing) approvals until we get it straightened out." One thing that won't happen under current practices is for perchlorate in any detectable level (4 ppb or greater) to reach a public water customer. CLWA would shut a well immediately if perchlorate were detected, McLean said, even though the state won't require well closure until it sets a final perchlorate standard. For now, the only contaminated wells are near the Whittaker-Bermite property. But there could be additional places to avoid when the next round of well digging gets underway. "Whittaker has been our focus, but now we're going to different facilities," said Sayareh Amir of the state DTSC's site mitigation program. DTSC is testing for perchlorate contamination at the National Technical Systems (NTS) plant at Golden Valley Road, and more sites could be added to the list as more perchlorate users, past and present, are identified. Determining who's been using perchlorate is the aim of a bill that passed the state Senate last week and would, among other things, require any company that used or stored more than 500 pounds of perchlorate in any calendar year since 1950 to file reports with the state. "We really know very little about who has been using perchlorate, and where," said Sujatha Jahagirdar of Environment California, the bill's sponsor. While critics say the bill duplicates existing law, a more sweeping Assembly bill has gained bipartisan support. That bill, AB 826, calls on DTSC to create a central data point to identify the location of companies and sites where perchlorate is used, stored or discharged, and it establishes new protocols for monitoring. As additional perchlorate uses become known to public health officials, more locations will be identified as possible sources of perchlorate contamination. "Now they're saying the waste from (CHP) highway flares is perchlorate," DTSC's Amir said. Each use of a flare wouldn't warrant investigation, but former flare manufacturing sites would — and there were several in the Santa Clarita Valley besides Bermite. The same holds true for the makers of the charges used to deploy auto airbags — such as NTS, where water sampling is underway now, and Specialty Devices Inc., which manufactured the devices in Placerita Canyon before moving to Moorpark. Even the old SOS sites in Sand and Mint canyons, where the state wrapped up its monitoring activities in 1993 — four years before the technology existed to detect minute quantities of perchlorate — might not pass muster today. "Our use of chemicals created in World War II and used into the Space Age has left a heavy footprint on our nation," Western Water Foundation director Rita Schmidt Sudman writes. "We need to learn from past mistakes." ©2003 THE SIGNAL • USED BY PERMISSION • RIGHTS RESERVED.